Fukudome and the machine translation « Japan, Hockey, Baseball, etc. Cubs biggest acquisition of the off season, Kosuke Fukudome, had a near-perfect MLB debut opening day at Wrigley Field, getting a double, a single, a walk, and the game tying homerun in the bottom of the 9th. But this being the Cubs, they lost game in extra innings. In a funny case of mistranslation, it seems like someone had been handing out bilingual “IT’S GONNA HAPPEN” hand held signs to Cubs fans as part of opening day promotions (this is the 100th season since their last World Series win for the Lovable Losers, and they have a pretty good team). But the actual Japanese printed on the signs “偶然だぞ” actually means “You Were Lucky”. So, it’s almost ironic that Fukudome had a great night while the home fans were unintentionally telling their newest import that he was just lucky. Hahaha, machine translations. That’s why us translators will still have work for the foreseeable future. Google Tranlsate gives “偶然だぞ” for “It’s gonna happen” and I guess that’s what the person used without checking it first with any number of Japanese speakers in Chicago. It’s on par with various Engrish found around Asia and misused Chinese characters in the West. It’s at least kinda funny though. This entry was posted on 2008 April 2日 Wednesday at 3:48	and is filed under 02_English, 03_Translations (英訳ポートフォリオ), baseball, culture, information, MLB, opinion. 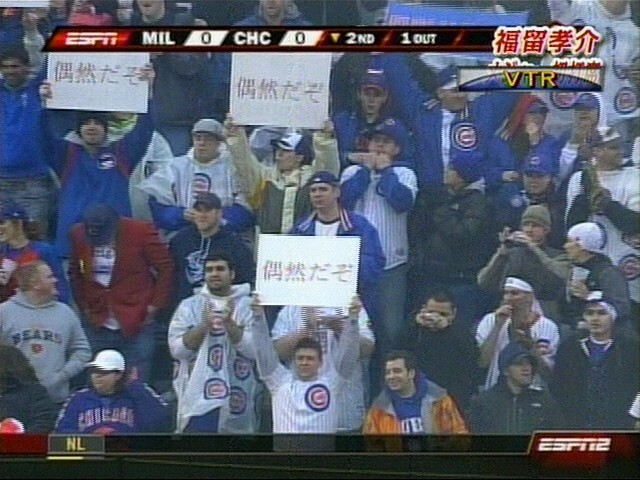 Tagged: chicago, cubs, cubs fans, engrish, fukudome, google translate, it's gonna happen, japanese, machine translation, mistranslation. You can follow any responses to this entry through the RSS 2.0 feed. You can leave a response, or trackback from your own site. Yeah, I considered that too, but that wouldn’t fit as neatly onto a handheld sign. Like in many translation cases, there is no single correct answer, and they’re often dependent on context. Googling for “偶然だぞ fukudome” or “it’s gonna happen translation” or some such variation turns up with many different translations of 偶然だぞ that are different, but not incorrect. “It’s just a coincidence” is probably how you would translate it if you were doing a direct translation (偶然 = coincidence), but if translating for feeling of what is being said, and how that would be said naturally in English, then “You Were Lucky” is pretty good. I mean when you think about it, after playing a game against someone who won, would you ever say “its just coincidence that you won”? Maybe, but I doubt it. People are much more likely to say “you were lucky this time” or something along those lines. So I don’t think you can say that “its just a coincidence” is a closer translation, rather its just a different translation style. gotta give em points for trying though. Yet another one lost in translation.